Home / Discover / Melisa Bajilla / News / [Discover] Doll Business To Inspire Black Children In South Africa. 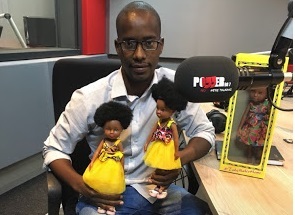 [Discover] Doll Business To Inspire Black Children In South Africa. Meshack Mulaudzi, born and raised in Venda Limpopo was never fascinated by the idea of fake hair, eyebrows on fleek and skin bleaching because that portrayed an awkward image to her daughter. The idea of the black dolls was birthed from wanting to buy a natural black doll for her daughter, they found that the dolls available in the store were not pretty and were merely expensive. Mulaudzi has always been an entrepreneur at heart and had thought of bringing black businesses to life. One lazy day he made a few sketches of her daughter, took them to the manufacturers and asked for 50 dolls to start off with. The dolls look naturally beautiful with natural afro hair, accessories, African print outfits and they are given the name - Mahle. They were stunned with the support and appreciation they received from the public. They have now sold massive numbers of dolls in malls located around Midrand, Northriding and more at a cost of R280. The company aims to economize the price to make the dolls affordable to every child. "For the past two years running the journey has been incredibly amazing and has created a bond of inspiration between my daughter and I," says Meshack. The company plans to create more toys for male kids too in the near future.